Everyone in the wine business got their start with a few memorable bottles, and believe it or not, mine were from California, back when I was nineteen and had just moved to Arizona from Nowhereville (Kalispell), Montana. It doesn’t matter where you start, you’ll always have a soft spot for the wines you got to know in those early years. One of those wines happened to be Zinfandel from great producers in California, like Williams Selyem, Ridge and Rafanelli. Back in the mid-90s, Zinfandel was hotter than Pinot Noir, Syrah, and probably only fifth in the fine wine division behind Cabernet, Merlot, Chardonnay and Sauvignon Blanc, with Viognier having a temporary uptick. The trends in California seem to change from one season to the next, probably more frequently than in any wine region in the world. But as a standalone economic global power, California residents consume enough of the state’s wines to keep it booming regardless of what trends come into play. One of my closest friends, psychiatrist Reuben Weinenger, once told me, “when you are surrounded by chaos, you need to stand still.” Wine trends can be chaotic, and there are producers who follow them and those who stay their own course. These producers who work in the eye of the storm make small changes along the way, but instead of executing radical alterations to fit the market, they focus their energies on mastering their craft. This way, they’re able to grow while keeping their identity intact. The Rafanelli’s are one of those rocks from the annals of old-school, traditional California wine. They’ve hardly changed a thing over the years, and every bottle brings me back to the first time I tasted them in 2001, when I started working at Spago Beverly Hills with the late, legendary Master Sommelier, Michael Bonaccorsi. Smack dab in the middle of the age of extraction, Mike remained committed to that old California taste and Rafanelli filled the Zinfandel department perfectly. California Zinfandel remains California’s unique heritage grape and some of the younger winemakers who’ve gone from one trend to the next are starting to quietly play with it again. (I won’t name names so they can surprise everyone when they’re ready to announce it themselves.) To better know the future we need to be conscious of the past and there is a reason why legendary California producers like Joseph Swan, Burt Williams from Williams Selyem and Tom Dehlinger—to name a few—made Zinfandel from Sonoma County alongside their great classically-styled California Pinot Noirs, long before Cali Pinot went sideways. And of course, we cannot fail to mention the fabled Zinfandel wines from the Paul Draper era at Ridge—some of the most compelling wines I’ve had from California. At The Source, we’ve picked a few fights in our market this last decade. I was literally laughed at by a future Master Sommelier for telling him that dry German Riesling was going to become a hot commodity—at the time we were selling Keller, Schönleber and Clemens Busch. We fought the good fight as we pitted the elegant Nebbiolo based wines from Alto Piemonte against the behemoths of the Langhe’s Barolo and Barbaresco back in 2010 with Tenuta Sella, when Cristiano Garella was in control of the estate and the wines had a short but remarkable run between the 2004 and 2008 vintages. Now there’s a gold rush to Northern Piedmont, and dry German Riesling is on every well-rounded wine list. 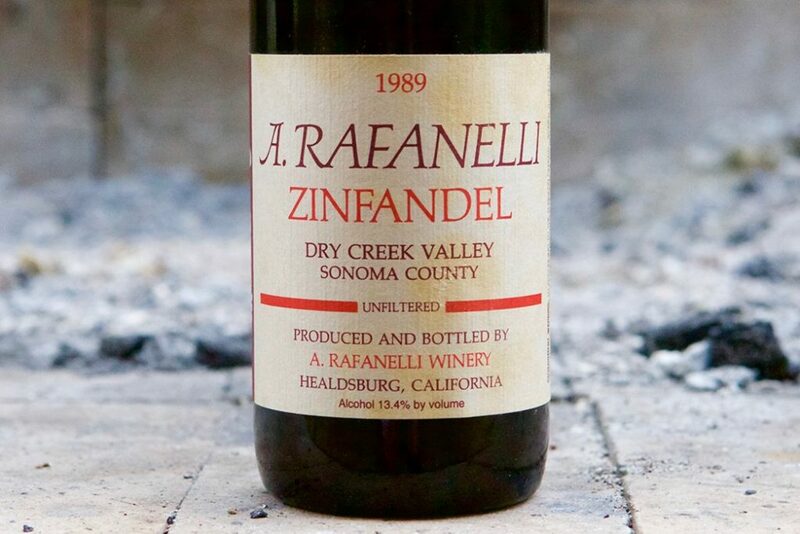 So, here we go again… Rafanelli is clearly a legendary Zinfandel producer, with the distinction of being fourth generation winegrowers in the Dry Creek Valley, and they’ve been making Zinfandel since the 1950s. When we agreed to work together, Shelly Rafanelli (the winemaker) brought me a couple bottles of old Zinfandels (1992 and 1989) her father dug out of his personal stash for me, and they were of the last bottles I drank before I moved to Italy this September. I was instantly transported back to the earlier years of my love affair with wine—the perfect sendoff to the country his ancestors emigrated from four generations ago.